On the Email Settings tab, set up default settings for the Pledge Reminder email, Tickler Reminder email, Organization Contact Email, and default set up for Acknowledgement Email PDF. This Email tab allows you to create the default body of various emails that are sent out of DonorSnap. When a Contact is entered in to DonorSnap, you can set an Organization Contact (the board member or key staff member from your organization that solicited that donor). When that contact makes a donation, the Organization Contact assigned to that donor can be notified with the email below. When a Tickler is not completed, DonorSnap will send a reminder. Set the default body of that reminder email here. When a Pledge is created, choose to “Send Reminders”. Choose WHO to send reminders to: the Contact, the OrgContact assigned to the Contact, or an Additional Email Address, such as a staff member. Customize the body of that email here. DonorSnap can send an Acknowledgement email with a PDF attachment of the Thank You letter you’ve uploaded as a Word document. This tool is under Processing > Email PDF Acknowledgement. In that tool, you can customize the body of the email to be sent at that time. 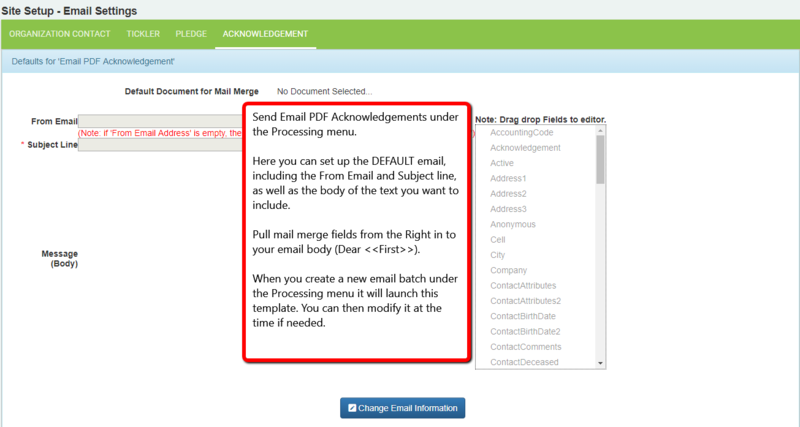 Here in the Site Setup, you can create the default email which will be included in that process, without having to recreate it each time.